Your sprinkler system is designed to keep your yard and landscaping looking great throughout the growing season. In most yards, it gets used at least three times a week, but during periods of dry weather or extreme heat, it’s not uncommon to run the system more frequently. All that use can quickly leave you looking for a Denver sprinkler service to perform routine maintenance and repairs throughout the year. Though it may be winter, being prepared for sprinkler maintenance and repairs once the weather warms up is always a good idea. Here are a few of the most common types of repairs you need to understand. Sprinkler heads are designed to spray water evenly across the yard. However, because they have so many moving parts, they’re particularly vulnerable to damage and leaks. While they may not be visible during the winter, these leaks can be a major problem once the ground warms up. If you have leaks around each sprinkler head, you’ll notice puddles and muddy patches around each head’s depression in the yard. In most instances, these leaks are caused by worn out seals on the sprinkler head itself. Your sprinkler repair team will be able to inspect the heads for signs of damage and take care of minor damage before the leaks wreak havoc on your lawn and on your water bill. Water valves perform two main tasks: letting water into your sprinkler system or keeping it out of the pipes. When the valve is turned on, water flows freely to the sprinkler head. If it’s shut off, the water will stay in the pipes and out of the irrigation system. Unfortunately. Many homeowners have leaky water valves that allow water into the system even when they want it completely turned off. This can lead to incredibly high water bills, especially if left unrepaired for the better part of a year. If you notice your water bill going up without you increasing your water usage, let your sprinkler repair team inspect the system for leaks. If none are found in the system itself, they’ll move to the valves and inspect them for wear and tear. In most cases, all the repair technician will need to do is replace the seal on the valve. If you didn’t have your system winterized in time, it’s possible that you’ll notice leaks in the pipes once spring comes around. If water is allowed to freeze inside the lines of your sprinkler system, it can expand and push against the material of the pipe itself. If the pressure gets to be too great, the pipe can crack. While it won’t be an issue when the water is turned off, it can be a major problem when you turn the water back on in springtime. Depending on the severity of the leak or crack, your lines may need to be replaced completely. The easiest way to avoid this is to schedule a winterization appointment and have the lines blown out before the first hard freeze of the year. Believe it or not, burrowing critters like chipmunks and mice love getting into your sprinkler system. The lines provide plenty of fresh water and the casings for the mechanisms make the perfect hidey hole for them to build their nests. Unfortunately, they can also chew through the wires and lines underground, leaving you with an underperforming or completely broken system. Though your sprinkler repair team may not be able to keep the critters away – an experienced exterminator can do that – they can repair the damage caused by the critters in the first place. If you notice that sprinkler heads aren’t popping up when the system is turned on or see that the controller isn’t working properly, schedule an inspection. If you notice turned up turf or rodent droppings in your yard, call a pest control expert as soon as possible. The electronic controller is what tells your sprinkler system to turn on and when. When it’s damaged or not working, your system may not follow the schedule you set. Typically, problems with the controller come down to user error. It’s easy to forget how to set the timer properly after a long winter of not using your sprinklers. However, other times the issue may be due to a faulty controller or poor wiring. 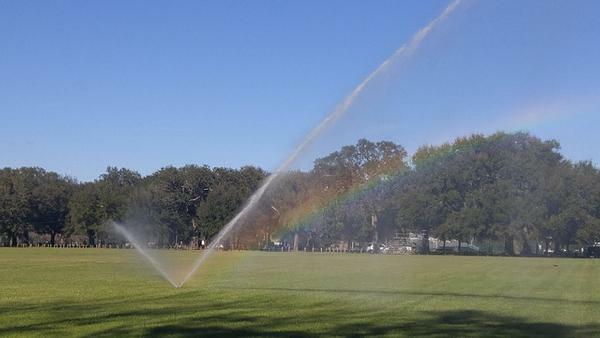 Regardless of what you think the problem is, make an appointment with your sprinkler service. They’ll be able to show you how to properly set the controller and, if needed, make any repairs to the system to keep the unit working throughout the spring and summer. Lightning doesn’t have to hit your yard or your home to do serious damage to your property. In fact, if the strike is far away, but still causes a power surge, it’s still strong enough to damage your sprinkler system. Worse, the damage can go unnoticed for a long time, making it worse during the spring and summer months. The only way to know if you have lightning damage in your system is to monitor the performance of the sprinklers when the system is on. If the controller flashes an error message or you notice a black scorch mark near the unit itself, the power surge may have damaged the electronics. If a section of your system isn’t responding to the controller, the lines and mechanisms underground may have also been damaged. No matter how minor or severe you think the problem is, it’s always best to leave the repairs to the professionals. At Water Solutions Sprinkler Service, our dedicated technicians are equipped to handle everything from routine maintenance to full system replacements. We’ll make sure your sprinklers are working properly whether you’re just noticing the signs of damage or are simply concerned about a slow-moving sprinkler head in the corner of your yard. Don’t put off your maintenance inspection. Contact us today to schedule a free no-obligation estimate for all repairs.